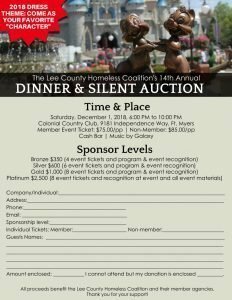 Please join us for the 14th Annual Dinner and Silent Auction on Saturday, December 1, 2018, 6:00 PM to 10:00 PM. 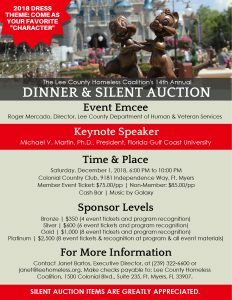 Roger Mercardo, Director of the Lee County Department of Human and Veteran Services will emcee the evening. Our Special Guest Speaker is Dr. Michael Martin, President of Florida Gulf Coast University. Additionally, we will recognize the Annual Dean Blietz Award winner! 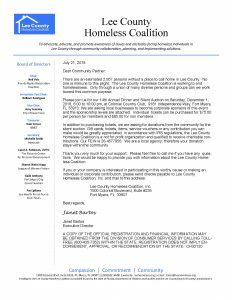 SILENT AUCTION ITEMS ARE GREATLY APPRECIATED.